Stoll, Glickman & Bellina, LLP has the resources to take on powerful opponents. 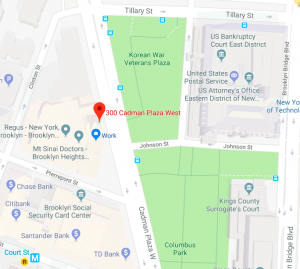 The three partners, a talented attorney staff and committed support people work from state of the art offices in Brooklyn near the Barclays Center, and an Uptown Manhattan satellite office convenient to Bronx, Manhattan and Westchester train and bus lines. Stoll, Glickman & Bellina is unique – large enough to have more flexibility on the cases it takes than sole practitioners, but small enough that each client gets the attention they deserve. We have four practice areas: civil rights, employment law, criminal defense and election law. We also have extensive experience with appeals and juvenile crimes. Our commitment to these areas of law allows us to provide smart, aggressive representation to our clients with a level of knowledge and skill recognized by our clients and adversaries alike. Prior to forming Stoll, Glickman & Bellina, each of our attorneys accumulated an impressive track record advocating for New Yorkers up against a large, complex legal and political system. Together, we formed Stoll, Glickman & Bellina to protect our clients with the energy of radicals and the know-how of insiders. We love what we do because we do what we love – challenging the system. We are experienced lawyers who respect our clients and relentlessly pursue every case to the end. We have built a firm that reflects that passion, a passion we maintain today. If you or someone you care about has been the victim of police brutality, feel you may have a claim against your employer, or are in need of criminal defense representation, please call Stoll, Glickman & Bellina, LLP at (718) 852-3710 to discuss. For representation in connection with political office, ask for Leo Glickman.